When a recipe calls for large, extra-large or any other size of shrimp, it is simply referring to the amount of shrimp that will fill a one-pound order. (NAPSI)—Adding shrimp to your diet can be a tasty, nutritious and affordable way to eat more seafood. That’s good news, since the experts at both the U.S. Department of Agriculture (USDA) and the U.S. Department of Health and Human Services recommend that people consume at least two servings of seafood—such as shrimp—each week. To help, here are some tips on selecting, storing and preparing shrimp from Rima Kleiner, MS, RD, National Fisheries Institute, and the USDA. Q: After purchasing shrimp, what’s the best way to store it at home? And how long will shrimp keep? A: Cooked shrimp may be stored in a sealed container for no more than three days. Raw shrimp should be stored in the coldest part of the refrigerator and cooked or properly frozen within two days of purchase. Q: How do I thaw frozen shrimp? A: Refrigerator Method—Place the frozen shrimp in a clean container and loosely cover the top with plastic wrap. Place the container on a low shelf in the refrigerator and let the shrimp slowly defrost for about 24 hours. Use the shrimp within a day after that. Cold-Water Method—Place the frozen shrimp in a leakproof plastic bag and submerge the bag in cold tap water, changing the water every 30 minutes, until the food has defrosted. After the shrimp have thawed, cook them immediately. Another option for a quick-thaw process is to microwave the shrimp on the “defrost” setting. Be sure to stop the defrosting when the shrimp are icy but pliable. Q: How can I determine if/when my shrimp are sufficiently cooked? A: Most seafood, including shrimp, should be cooked to an internal temperature of 145ºF. Without using a food thermometer, check for these signs that shrimp are sufficiently cooked. The texture of properly cooked shrimp will change from mushy to firm, the color will turn from brownish-gray to a warm, orangey-pink, and the meat will become pearly and opaque. Q: What is considered a serving size for shrimp? 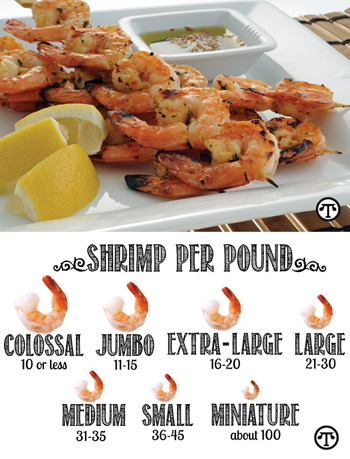 A: A three-ounce serving size contains about four large shrimp or two to three colossal shrimp. A three-ounce serving of shrimp contains less than 85 calories, plus 1 gram of fat and about 20 grams of protein.